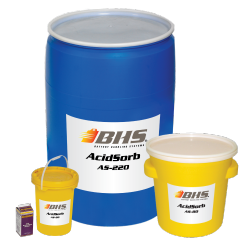 Acidsorb is a granular sorbent that neutralizes and absorbs spilled battery acid (electrolyte) quickly and safely. * AcidSorb provides a visible color change to indicate complete neutralization, is environmentally friendly, and easy to use. * AcidSorb is not for use on hydrofluoric acid (HF) or compounds containing HF. Personnel should be trained and qualified to clean up hazardous materials. Dispose of in accordance with regulations of local governing bodies.